A library of objects enabling the design of installations of any type: HVAC (heating, ventilation, air conditioning), piping, ducting, plumbing, gas, medical, fire-safety and refrigeration installations as well as other kinds of technological installations for building construction and industry applications. Functions such as the design of plans and diagrams, isometric views, plans, and cross-sections, allow the user to employ a single software solution in designing a complex project. - Designing all types of complex installations. 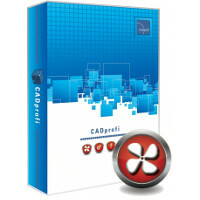 - Facilitating the drawing of plans, cross-sections, diagrams and isometric views. - Automatic drawing of pipe and ventilation ducts. - Automatic joining of ducts and pipes with any selected form parts. - Calculating the lengh of wires and the surface of ventilation ducts.